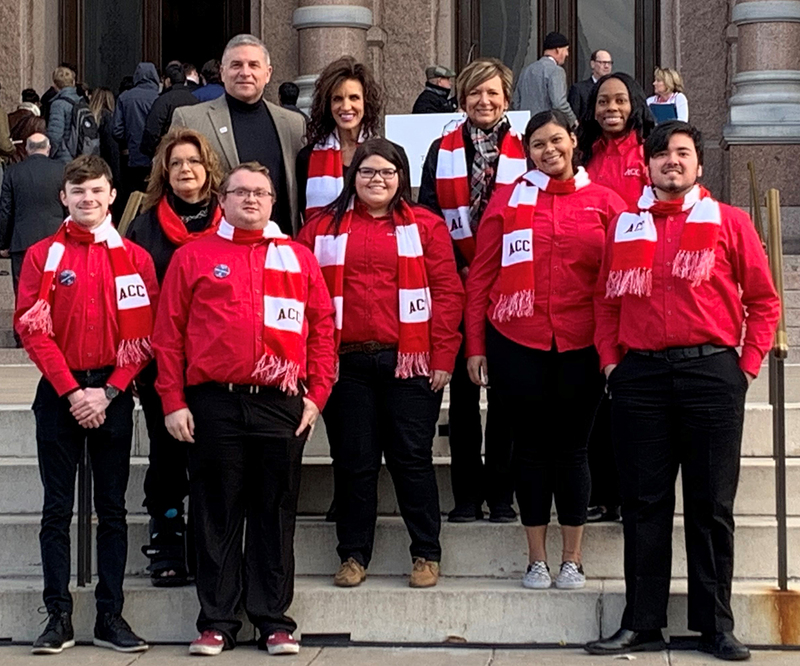 Faced with issues such as rising textbook costs, the need for mental health services and changes to Dual Enrollment, Alvin Community College students visited with lawmakers on Community College Day at the Texas Legislature on January 30. Community colleges play a major role in educating Texans and is, said State Rep. J.M. Lozano during the recognition of Community College Day on the House Floor. “Some of the many opportunities that community colleges provide for our students are the ability to participate in Dual Credit programs, receive technical training that will prepare them for the workforce and allow students to complete their college degrees with less debt,” he said. A group of ACC students and staff spoke with State Rep. Ed Thompson and representatives of State Sen. Larry Taylor during Community College Day. Students talked about a variety of issues including the cost of textbooks, course transferability, mental health awareness and Dual Enrollment. Asked if there would be any adjustments to Dual Enrollment in Texas, Thompson responded that he would like to see the program increased along with more advising for students in high school and junior high school. “I hope that we see an expansion of opportunities for those students,” Thompson said. “I think it’s the best thing to come around” in education. As students face rising textbook costs, the legislature may pursue funding alternative textbook sources including digital material, Thompson said. Legislators may also explore the possibility of providing additional mental health services to students, Thompson said. “You are going to see a lot more discussion of that in this session,” he said. Students asked about how legislators could help ensure that the courses they take transfer to the university level. Senate Higher Education policy analyst Daniel Warner spoke about the possibility of a data sharing program between community colleges and universities that would help students make proper selection for their degree program. “I think collaboration with faculty groups will get us moving in the right direction,” Warner said. Whatever the outcome of the legislative session, Thompson encouraged students to stay in contact with their state public officials. “Always feel free to come and speak with us,” he told them. ACC students and staff pose in front of the Texas Capitol during community college day on January 30.